It should be the perfect match. Short term health insurance is very popular now due to open enrollment restrictions. Anthem Blue Cross is 3rd. 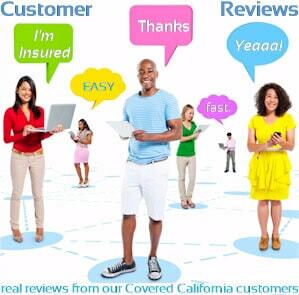 How do we get short term health insurance through Blue Cross or Blue Shield of California? They both used to offer such a plan. And they were very popular. First, Anthem Blue Cross pulled their short term plan. Then, Blue Shield pulled their short term health plan from the market but we do have a workaround. 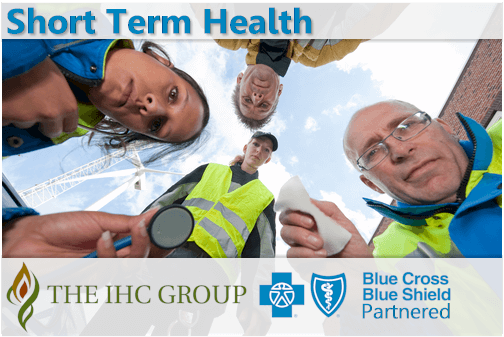 Most importantly, while other carriers have left the short term market or re-filed their plans to meet new requirements, this IHC plan with Blue Cross Blue Shield WAS the only legitimate temporary health plan available. IHC has basically partnered with the nationwide MultiPlan network to give you access to over 900,000 providers nationwide. Most importantly, this is a full network...not the Covered California narrow network (about 1/3rd smaller). A quick explanation of how this works. In California, Anthem Blue Cross and and Blue Shield of California are two separate carriers. Nationwide, they are Blue Cross Blue Shield. You'll see this designation when you quote the Short Term. 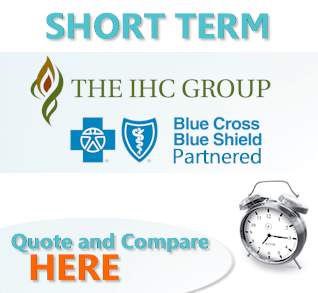 IHC partners with BCBS (Anthem Blue Cross in California) to market the short term. The policy uses the MultiPlan network which is a nationwide network with more than 900,000 providers contracted. This is great news since some of the other short term carriers offer pretty questionable networks. The whole point if we have an injury or illness during interim periods is to have access to great doctors. We've got that with the IHC/BCBS relationship. 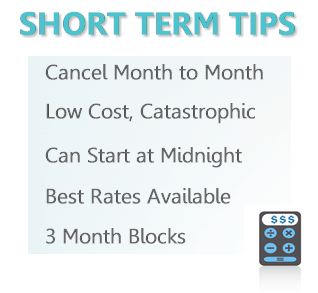 Let's look at some basic aspects of how short term works. IHC WAS the main short term carrier in California as the other carriers have to re-file to meet 3 month changes. We now have AlieraCare InterimCare health sharing plans here. It's really designed for short periods of time (up to 3 months) to protect against the big what if. For example, if you need short term health coverage between jobs. For this reason, it's very popular these days. IHC California short term plans with Blue Cross Blue Shield sponsorship addressed all these issues. Let's understand how to shop and compare the plans. First of all, short term is really geared for catastrophic type coverage. It's not really made for first dollar coverage such as preventative and RX. It handles the torn ACL or car accident really well. You'll notice two things when shopping your Blue Cross Blue Shield partnered short term plans through IHC. There are three major components to the plans. These three items affect the pricing along with your area and age. This is an amount you will have to pay first before the plan starts to help. We have a $2500 deductible. This means you'll pay the negotiated PPO rates until you meet that deductible before getting help. Being in-network (using PPO providers) can save you considerably even before you meet this number however. Once you meet your short term plan deductible, you then start paying a percentage of the costs. For example, let's say we have our $2500 deductible above and a 50% coinsurance. We have a $3000 bill. We'll first pay the $2500 deductible. We'll then pay 50% of the remaining $500 or $250. We get these benefits when we stay within the network of doctors and hospitals for covered benefits. You'll receive an ID card with the link to search for participation MultiPlan doctors with your short term plan approval. Now, the most important part of a short term health plan. The Out of Pocket Max. This basically defines the backend exposure for a very large bill. With the IHC short term plan, the max out of pocket is in addition to the deductible. In our example above, let's say we have $20K bill (very easy these days). If we pick a $5000 max out of pocket, we would first pay the deductible $2500. We would then pay 50% until we pay another $5000 (max out of pocket). That's total exposure of $7500. This would be our exposure for covered benefits, in-network. Finally, there's a maximum benefit with the plans. This is the max amount that the plan will pay up to but it's very high. Open heart surgery these days might run $100K+ so the max is more than adequate. Those are the bullet points for the IHC short term with BCBS partnership. So we have a temporary health plan option (up to 3 month blocks) that allows us to use the MultiPlan network of doctors. This is currently the only legitimate carrier for short term as the other carriers have either pulled their plans or are re-filing to meet the new 3 month window requirement. Enrollment is all online and though medically underwritten (must qualify based on health), the process is simplified. Please call 800-320-6269 or email us with any questions. There's no cost for our services! For further review, check out our master article on short term health insurance coverage and plans. 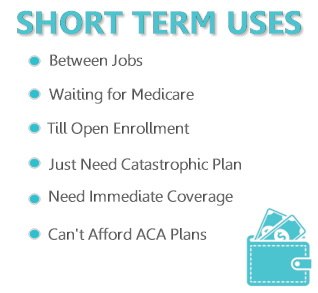 Short term coverage is a great way to address interim periods of time such as between jobs, waiting for open enrollment, the need for immediate health coverage. Call us at 800-320-6269 and we can go through any questions or run your instant Short term quote and enrollment. Thanks!